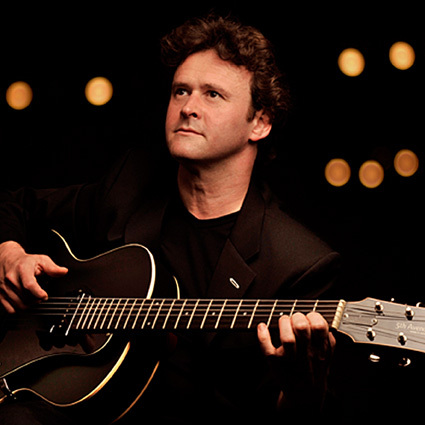 Sylvain Luc (born 1965) is a French jazz guitarist. His musicality, his great sense of improvisation and his virtuosity, and unique, technical abilities with the guitar have earned him high (but discrete) praises from all around the world, including from many musicians he has played with. He is very regularly on tour, but very rarely makes appearances in high profile jazz festivals. As a result, he has little international recognition. His most well known works are the two duet albums with Biréli Lagrène, with whom he has toured many times. He is an ambassador for Godin guitars since 1993. He is very attracted to duets, but has also been seen within trios (for instance his own trio, but also Trio Sud, and on tour in 2009 with Steve Gadd and Richard Bona) and more rarely with larger groups. Sylvain Luc was born in Bayonne, France, the youngest of three brothers. His two elder brothers (Gérard, the eldest, playing theaccordion and Serge, playing drums) were both musicians who regularly played in balls. At the age of 4, he laid his hands on a toy guitar with only three strings left on it and was allowed to accompany his brothers on rehearsals. Even at such a young age, he was able to play accurate chords. As a result, he started touring with his brothers playing balls at a very early age. Being immersed in a musical environment, he was regularly in touch with other musicians. One of them, the late Joe Rossi (who taught accordion to his elder brother Gérard), suggested that he to listen to (and offered him an LP of) Joe Pass (Portraits of Duke Ellington). This, and other encounters at his parent's home (in particular guitar player Michel Ducau-Lucart, who offered him his first guitar), led him to listen to, and appreciate, jazz music. At age 9 he performed for the first time on an album with his brothers (Elgarrekin), and played in the first part of a concert of Joe Dassin with a local group. He also entered the conservatoire of Bayonne. While the guitar is his instrument of choice, there were no courses for the guitar at the conservatoire, so he chose to study cello instead, and gained a taste for classical music. Luc has commented that his study of the Cello helped him build strength in his fingers which was beneficial for guitar. At age 12, he performed on a second album with his brothers, Oinakarin. He also became fluent with other instruments along the way, including the mandolin, the violin and the bass. At age 15, Luc formed a jazz group called the "Bulle Quintet," and quickly gained recognition. Two years later, in 1982, he and his group were elected laureate of the international festival of San Sebastian. He quickly became the most sought-after guitarist and bassist in the Basque region, and began to tour regularly. In 1985, he metMarie-Ange Damestoy and became her guitarist, arranger and composer. Two years later, in 1987, they were nominated revelation of the Printemps de Bourges. In 1988, he came to live in Paris and became an arranger, composer and accompanist to many different French artists, including Al Jarreau, Catherine Lara, Michel Jonasz, all while being the bassist for the Richard Galliano trio. Among the musicians he has played with are Dee Dee Bridgewater, Michel Legrand, Erkan Oğur, Richard Bona, Steve Gadd, Biréli Lagrène, Elvin Jones, Wynton Marsalis, Stéphane Belmondo, Manu Katché, Michel Portal, Bobby Thomas JR, Andy Sheppard,Jacky Terrasson, André Ceccarelli, Jean-Marc Jafet, Alain Caron, Didier Lockwood, John McLaughlin, Bernard Lubat, Lokua Kanza,Richard Galliano, Ivan Paduart, Steve Lukather, Keyvan Chémirani, Billy Cobham, Victor Bailey, Larry Coryell, Al Di Meola andTommy Emmanuel. In 1999, he founded the Trio Sud along with André Ceccarelli and Jean-Marc Jafet, an ensemble with which he obtained the "French Music Award for Jazz music" as the best formation of the year in 2003. Since 2006, he has regularly found himself in the "String quartet," alongside Didier Lockwood, Victor Bailey and Billy Cobham. In 2009 he toured across Europe with Steve Gadd and Richard Bona. Sylvain mostly plays with Godin Multiac guitars, both the nylon and steel string versions. The particular sound of this guitar has partly become part of his unique sound. He also, but less frequently, plays with the 5th Avenue series, always from Godin (he is seen with a black-colored 5th Avenue series on his album Standards). He also, but even more rarely, plays on classical guitars.